I’ve made this as a small cake or as a large cake and it’s just as easy to create either way, you just need a little math (which I’ll provide below) and the right pans. I’ve made this cake for Ben several times now. Last year we made two enormous sheet cakes to serve the whole youth group, using jelly roll pans (the cookie sheets with 1″ edges). This year I increased the cake batter slightly to make sure we had enough for our family dinner party with leftovers to spare, but the basic 2 layer recipe works fine for a single family dinner. Combine flour, baking powder, baking soda, and salt in a large bowl and set aside. In a large mixing bowl, beat shortening until fluffy and then add sugar and vanilla. Add eggs one at a time and beat well to combine. Combine bananas and buttermilk (or regular milk with a bit of lemon or vinegar to sour it). 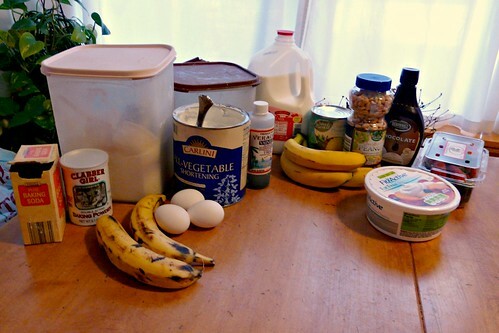 Add small portions of flour mixture and banana mixture to egg batter alternately until fully combined. Prepare 3 8″ cake pans by greasing with shortening well, then dusting with flour. (See my video demo here) This will help the cakes come out of the pan nicely without sticking or breaking. Pour the batter into these pans. Bake at 350 for 30 minutes or until they test done with a toothpick in the center coming out clean. Remove from pans and cool on racks. The sheet cakes will cook faster since they’re thinner, so check after 20 minutes. For 2-layer cake, split layers in half (this can be tricky since the cake is tender – adding toothpicks as guides to keep it even and using a long bread knife makes it easier). Assemble as desired and serve! Split whipped topping into two parts. Mix well-drained pineapple into one half and ssliced strawberries into the other. 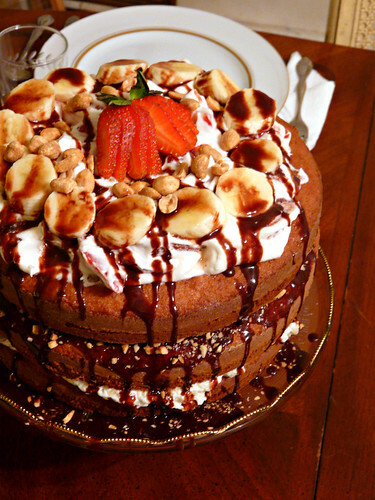 Top with extra sliced bananas, more chocolate sauce, whipped cream, strawberries/cherries/sprinkles etc. Servings: 8-10 for 2 layer cake, 12-16 for 3 layer cake, and 20-24 for sheet cake.